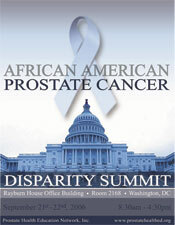 The "2nd Annual African American Prostate Cancer Disparity Summit" returned to the same location in 2006. Senator JOHN KERRY and Congressman GREGORY MEEKS again collaborated wih PHEN in hosting the summit. They both participated in the summit and were joined by nine (9) of their collegues in the U. S. Congress. The success of PHEN efforts to actively engage congressional leaders was clearly obvious. Senator Kerry and Congressman Meeks introduced legislation in the Senate and House respectively to designate prostate cancer as a crisis of epidemic proportions. Click on the program image above for information on the program and participants. This summit also had a strong focus on establishing a scientific and evidence basis for "Why The African American Prostate Cancer Disparity." There were a series of outstanding presentations of research done in this area, prompting some insightful discussion. These presentations were effective in dispelling myths and establishing a solid framework that can be used to guide actions to address the disparity. Many of these presentation are included on this page for review and information. Click on any of the presentations. Immunotherapy vaccines were on the agenda for the second straight year. This potential new treatment is viewed as a possible breakthrough in initially helping men who are suffering at the end stage of their cancer progression. Black men are more likely to be at this end stage as reflected in the higher death rates. Presentations on this subject are also included on this page. PHEN established a medical and research advisory board that includes many of the individuals who presented at this summit.